Leave it to love! The romantic tree design on this affordable 3 in 1 wedding invitation is printed along with your wording in your choice of ink color and lettering styles. The 3 for 1 wedding invitation includes three pieces - a wedding invitation, response card and reception card - all for one low price. Due to the unique printing process required to offer you this invitation ensemble at a lower cost, all three pieces come on one sheet and are perforated for easy separation. This product features thermography printing. Thermography is a unique printing technique that results in raised lettering you can feel, which adds to the luxurious experience of this printed piece. Includes inner and outer invitation envelopes and response card envelopes. Great price, quality and easy to use! The pieces easily tore apart- doesn't even look like they were perforated to begin! Makes the invitation process for weddings so much easier!!! This product is exactly what we wanted. Short, sweet, cute, to the point and all at a great price. I only wish the perforation wasn't so noticeable. But, that's not a huge deal. The quality of the product and the helpful service we received while ordering was outstanding! We could not be happier with our decision to use Invitations By Dawn. Extremely happy with my invitiations! I ordered these invitations for my wedding. The product quality was better than I than expected given the cost. I am very happy with my invitations. The gold shimmer envelopes were beautiful as well. After looking a many designs on line, my daughter found this one and we all loved it. We did up grade to the heavier paper. Was concerned about how they would separate. It was a simple, just fold them slightly and they snap right apart with no rough edges. Invitations were of good quality with a speedy delivery. Costumer service reps were very helpful. I love these invitations - they look absolutely beautiful, and arrived only a week after we ordered them. I highly recommend Invitations by Dawn and this invitation! We ordered the 3-in-1 Tree of Love invitation, with hunter green color and a textured paper. They were really beautiful, arrived very quickly, and were a very good deal price-wise. We ordered it without the inner liner to save paper, but the outer liner was a bit see-through then, so I wish we'd kept the inner liner (it's no extra cost). We saw a tip to use an old membership card or something to smooth out the perforations, and that worked really well. Overall we were very pleased with the invitations, and Invitations by Dawn. I was very excited to receive my invitations. They were packaged carefully and clearly marked. The font on the response card was smaller than I thought it would be, but I overlooked this when reviewing the proofs. The Raisin ink color was a lot darker than expected and it's hard to tell that it is a color other than dark. I was very happy with the feeling the raised ink gave the invitations as it added a little oomph to what could be a fairly plain card. I didn't mind the perforated edges that were left after separating the cards because I was putting them on a backing, but some people may have some issues with this as it looks a bit unfinished. Definitely worth the price. This was just as I hoped! It was so fun feeling the raised up ink and they are so cute! They were very easy to separate and assemble :) We didn't need a direction card for the reception so we put a bible verse and a link to our website on the additional card! Well worth the money! This purchase experience was amazing. The product was amazing in regards to quality, the delivered at top speed and it was such an easy process (for a great price!). Awesome product! Very happy with the 3-in-1! Even more beautiful than I imagined! I ordered these as my wedding invitations and they arrived VERY quickly and were absolutely gorgeous! I would highly recommend this to anyone even remotely interested. Arrived very fast. Exactly how they appear on website. Proof was sent to me right away. Quality is good. Beautiful! I absolutely love them! I can't wait to send them out. These turned out exactly as I had hoped!! We payed extra to have the RSVP envelopes addresses as well as our return address on the main envelope! Definitely worth the cost, they look great and it's very convenient! I love how the ink is raised and it is the color I want! I would recommend ordering samples first just to pick out the best color that you want( they send you a sample booklet with all the colors available for this invitation)! Love that it is different than most invites and it was affordable!! My fiance and I ordered these because they were simple and had all three pieces together. We changed the ink to an olive green color. We've gotten many comments on the raised and textured feel of the tree and ink. They really look great! The only concern was that the ink color was a little blotchy on the tree. It isn't the most noticeable so we just used them. Also, there was an issue with a line not being present on the RSVP cards with our first order. When contacting the costumer service person (Paige), she saw that it was present on the proof that we sent so it was their error. It was corrected and a new proof sent to me. Unfortunately, this one split a line on the RSVP in two so that needed to be changed. But the third time it was perfect and they were delivered very quickly. The final product was great! We couldn't be happier with the way our invitations came out. They were exactly what we wanted. Also, I loved that we were able to have free samples mailed to us, so that when it came time to order we knew exactly what kind of paper, ink color, and design that we wanted. They arrived SO quickly too! Absolute perfection. Beautiful ink- I could have chosen 100 different designs. I fell in love with the 3-for-1 when I was planning a December wedding. The snowflakes were perfect! Then we decided a date in November would work better and snowflakes just didn't fit, but I knew I wanted a 3-for-1. I loved the trees, but I was slightly hesitant. Was it too cliche? Did it look dumb? Would it fit with my yet-to-be-determined theme?I held off ordering as I searched other invitations. I didn't find anything price comparable. I asked my fiancee, his parents, my parents, my bridesmaids and everybody really loved the sample Tree of Love I received. I decided to just go ahead and order them and . . . I LOVE THEM! They are so perfect and look so much better in person that on the internet. The color (claret red) is the perfect match to my colors and I love the look and feel of them. I am so glad I ordered these and cannot wait to send them out! I absolutely love our invitations. They came out exactly as we wanted them to and the quality was so much better than I had thought! They were delivered so quickly and the website was so easy to use when picking colrs/wording! I have recommened Invitations by Dawn to all my soon to be bride friends! ANd they ship to Alaska for no extra cost! They are exactly what I was hoping for. Paper quality is wonderful. Ink is glossy. Couldn't have asked for more. We love our invites! Originally wanted to incorporate both our colors, but, still very nice in just one color! More information on how to personalize the page would have been nice. All in all, we are very satisfied! Especially receivinga couple extra, they came in handy. I thought they tuned out great, but I don't like the fact that they are one piece of paper and you have to break them apart. I knew it when I bought them, they still look good it was just an inconvenient. Awesome invitations that are worth much more than the price! GREAT invitations! My mom actually called me after she recieved her's and thought I spent over a thousand dollars on them!--but no, with my extra two inserts and a paper upgarde, I still only spent a fourth of that!! Printing quality was excellent and the colors and paper looked great! A few of the invitations weren't as perferated as the others, and the perferation was minimally visible on a few--but I don't think it was noticeable at all. I saved tons of mony and these invitations were well worth it! Great buy, good value, beautiful end product! Absolutely love the invites! So pretty, definitely get the digital proof. Mine didn't come out as expected on the proof at first, but they fixed it quickly and emailed me another proof. Fantastic service and was delivered quickly as well! Great product for your money, nice design, quality printing and envelopes. Definitely get a few extra envelopes in case you make a mistake, they are inexpensive and worth it! I just thought they were seperate pieces. I didn't know they were all on one page. Its my fault for not reading everything. I got the 3 in 1 and they are perfect! The color matches our save the dates perfectly! I will be using you again for all my invitation needs! These invitations came out beautifully! I appreciated how much less expensive they were. They are elegant and look very nice. My only caution is the perforation from the 3-in-1, although I knew what I was getting since I ordered a free sample beforehand. I do not mind the perforation, but someone who wanted something 100% perfect might not. Overall, worth the while for a great price and a beautiful invitation. My original order was for Ecru textured paper in Olive green ink. The olive green ink bc of the amount of ink that is used on the tree, etc came out more of a dark Hunter green. Just FYI in case you are thinking of that. Luckily IBD has excellent customer service and we decided that if that was the case then the apple green would look like what i wanted. I got new invitations sent to me and now they are perfect. The textured paper is also awesome look for this nature-y invite.Thanks! These invitations turned out great! They are a slightly different green than our wedding colours but we fell in love with the design and will go well with our nature themed wedding. They were perfect, only downfall postage is costing more than expected. Great product & wonderful value. They were easy to edit, looked very nice, arrived quickly, & were well received by all that we sent the invitations to. great product but beware of fonts! DO NOT USE CARPENTER FONT FOR ADDRESSING!!!! I absolutely love everything about my invitations except my RSVP cards have the address printed in carpenter font and my guests are telling me they're receiving their's back as "undeliverable" because the USPS cannot read the numbers on the address. SO FRUSTRATING! Besides that it's a great product just make sure to use a different font. They're gorgeous and a fantastic price. 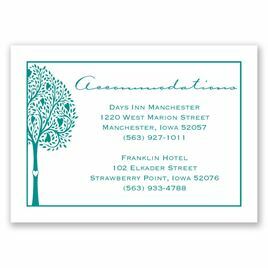 I have already ordered from invitationsbydawn.com again for thank you cards. Me and my fiance we're very impressed when we received these in the mail!! They were more beautiful in person and couldn't have found something more perfect!! THe only complaint i have is that there is nothing that checks for gramatical errors.. Because i was in such a hurry (my fault not Dawns) i spelled accepted wrong. Again my mistake but just a suggestion. Beautiful invitations at a great price! These invitations were just perfect for us! The quality for the price can't be beat! When they arrived, the color was even more beautiful than I expected, and the raised ink made them look much more expensive! I thought it was great that you could customize what you wanted them to say. They arrived very quickly after we ordered them as well! The assembly was very easy, and the perforations were deep enough to avoid having to use scissors. Bonus: With the invitation fully assembled (invitation, reception card, response card in envelope, and inner envelope) the postage was still only $0.46! We just mailed them out yesterday, and I hope everyone else will love them as much as I do! Error on size of type requested. Reprinted quickly at no charge. I love this company. We loved this invitation which came exactly as expected. The invitations have all the pieces you need at a great price. We were a bit nervous having never heard of this company but have been impressed. We got exactly what we were looking for without having to spend a fortune. The invitations came out better than I expected! Very nice quality, and professional looking. It was very easy to tear apart the cards on the perforations, leaving a clean finish. Highly recommend! Great value when on a budget! Great Invitations for a great price! I was searching for an invitation that would go with my Fall wedding theme. When I found this invitation my search was over! I will use this product for my November wedding. I liked the three in one invitation. Perfect for my rustic wedding, this 3 for 1 invitation was easy to personalize and the quality surpassed my expectations. Great price, great product. Beautiful & Received Many Compliments! I absolutely love these 3-in-1 invites but didn't give it 5 stars only because they're not for the perfectionist. The borders around the individual portions are not evenly spaced & there are some slight ink discrepancies between some of the invites. It's a good thing I ordered extras because I had two that were blank. All in all, for the price, these can't be beat. You can barely see the perforated edges & all you need to do is run your fingernail along them & it's not noticeable. The paper is good quality & the color selections were great. These invitations were perfect! I ordered the brown and white/cream as shown. The colors were great with no imperfections and a nice weight on the card stock. What I loved most about them, aside from the price, was how I was able to redo the wording myself. I also used the additional card and reworded it for the Hotel information. I took my time with the wording, font and colors. I was able to view the invitations before submitting my order. My order arrived fast and was packaged very nice. Take your time separating the pieces. Bend them repeatedly to help with separation. When separated, run a credit card or something similar down the perforated sides to smooth them out if needed. The postage was 66 cents for the 3 piece invitation, RSVP envelope, and directions in a colored inner envelope placed in the outer envelope. So far I've had rave reviews about the invites. The picture has flash glare on the raised ink portions of the invites - this is not missing ink or blotches. Also they are not super glossy in person. I initially opted for this invitation over a more expensive option after ordering samples, mainly because it was more cost effective. After receiving the finalized printed invitations in the mail, and in the color coordinated with my wedding, I loved them. I'm really glad I picked these instead of the more costly ones. Not only were they cheaper, but once they were printed I'm pretty sure I like them better. Everything coming in one sheet made stuffing envelopes extremely easy. Just tear it apart and put it in the envelope. No worrying about if everything made it in there, because it all came as 1 unit. I loved this product because it was perfect for my second wedding. It gave me all the important pieces, for a low price and they are beautiful. I couldn't be happier! I made sure I was not in a hurry and completely focused on the task at hand when I sat down to separate the pieces. I still ended up with some slight tears but my guests are not the type to judge minor imperfections, and neither am I. Loved the design and the color options. These worked very well for our budget. I really loved the invitations. However, they do arrive in a single sheet as shown in one of the images and the perforations between the three cards could have been deeper. Some of the sheets I had trouble getting apart without physically cutting them. The perforations also leave a little bit of an unfinished edge, but that I fairly easily fixed by running my finger once or twice along the perforated edges. The raised ink is absolutely wonderful when it comes out correctly. I ordered 150 invitations in the claret color and only one came out with the ink so heavy it looked a different color. Also, there were a few spots on about half the cards, and usually only in one very small spot, where the ink from the tree design did not stick. I've attached an image showing a card with two spots missing, which was very unusual. I apologize for the poor image quality. I really loved these invitations and the many ways to customize it. However, I would recommend ordering a few extra in case of mishaps with the perforations or ink. This invitation is really nice for the price. The paper is good quality and the color is perfect. The only issue I had was that I expected the font on our invitations to look exactly like the sample, as we used the same fonts. When we got our invitations, our names were very small and hard to read. The font needed to be enlarged but we didn't know that when we ordered them, it wasn't indicated anywhere as far as I know. The sample looked much nicer. We didn't have time to re-order so we just sent them out. As cute as I hoped! The invites were exactly what I expected and saw online!! So cute. My fiance and I didn't want to spend too much on invitations, and these turned out to be perfect. You get 3 cards in 1 and you can't beat the price! We paid half of what we would on any other invitation. The paper quality is thicker than I expected and the design and writing is raised so when you run your finger over it you can feel it. The best part is that you can customize the color, text, font and size of font. If it isn't perfect they will make sure to make it perfect. Can't wait to send them out! Thanks! I was very impressed with these invitations! They were easy to customize, and look fantastic. The paper has a nice weight to it, and the textured thermography ink makes them look and feel expensive. Thankfully they were not! The perforations worked well too, you can barely tell they were connected. I've had lots of comments on them already! My only disappointment with them was that you can only pick one colour... It would have been nice to have the hearts and our names in a different colour. I really like the raised, shiny print on the invitations. The mocha color is lovely, too. My only disappointment was that the three in one is on a single sheet of perforated paper. However, considering the price--I'd say good value for money overall. turn around time was quick. invitations look really nice. great ink color. Extremely happy with my invites ! I ordered these for my wedding invitations and could not be happier! The color was beautiful, the information was correct and the price was great. Just sent these out in the mail and have gotten many compliments. Would definitely recommend these invitations! I especially loved the raised sparkly ink, very professional looking! Great quality for the price, simple but elegant at the same time. Didn't love that you couldn't have more than one color one the invite, but it worked out ok. I ordered these invitations because they look really nice online and affordable. Once I received them I realized that they did'nt even belong to me. I did not get what I order. Totally different names on them and wrong place and date. I called and they sent me new ones out but I still had to wait almost another week to recieve them after I had already paid for 2-day air. Also the font size is VERY tiny. I could bearly read them and others had to put eye glasses on the see what it said. So overall I was not happy with Invititaions by Dawn at all. Like I said before they got me the right ones but I should have recieved the right ones to begin with. I would rate this company on a 1 on a scale of 10. Very disappointing. A wedding is suppose to be a girls dream come true and they want everything perfect and then the company they decide to go with send them the wrong items. I will never order from here again.. and I had to take an hour off work UNPAID to resolve this problem over the phone and sit there and tell them everything that my intivitaions was suppose to say the FIRST time!!!! These invitations were perfect for our natural-themed wedding. The green print color was difficult to see online but it was very pretty. The directions provided were perfect and we easily printed addresses onto the envelopes provided (I have very little patience for hand-writing). I would recommend them as a great option for wedding invitations. I ordered my wedding invitations after receiving a sample of the 'Tree of Love' invitation (mocha color) in the mail. I was pleased with the quality of the paper and the ability to customize the invitation wording, fonts, and colors online. I ordered the invitation in "olive" after spending much time looking over the different thermography color options (unfortunately you can't order a sample invitation of the thermography color you actually want). However, when I received the invitations in the mail, the "olive" was more like a hunter green - significantly darker than I expected based on the color chart and online proof. The customer service team at Dawn was very receptive to my concerns and was willing to reprint the invitations to correct the color. Two sets of invitations later, the color is better but still darker than I originally expected. While this is a little disappointing, I greatly appreciated the customer service I received with Dawn. We were looking for something simple and elegant without breaking the bank. After researching many invitations with many suppliers, this was our first choice and we stuck with them. We were not dissappointed and would highly reccomend this company. The paper quality was very nice, the ink was beautiful and the personalization was easy. I loved that they sent us many free samples to choose from as well. I could not be happier with my 3-in-1 invitations. They are stunning and just what I wanted. They are a great value, but you'd never know by looking at them! I would recommend them to everyone! Invitations came out great! They were inexpensive and, out of all of the samples we ordered, the nicest quality for the value. We had one tiny issue with the RSVP envelopes, but we called the company and it was resolved immediately. I will be recommending this company to friends and family in the future! With the low price of these invitations I wasn't expecting much. I figured as long as everything was spelled correctly and the information was correct I would be happy. The invitations came a little less than a week after we placed the order. I could not believe the quality of the invitations for the price paid! These invitations are beautiful, and the printing is textured which gives these invitations an expensive look. I could not be more pleased with the product. If I need invitations for anything in the future I would definitely consider using Invitations by Dawn again!